Time again for Fishing in the Discount Bin, where I watch a movie and blog about it. 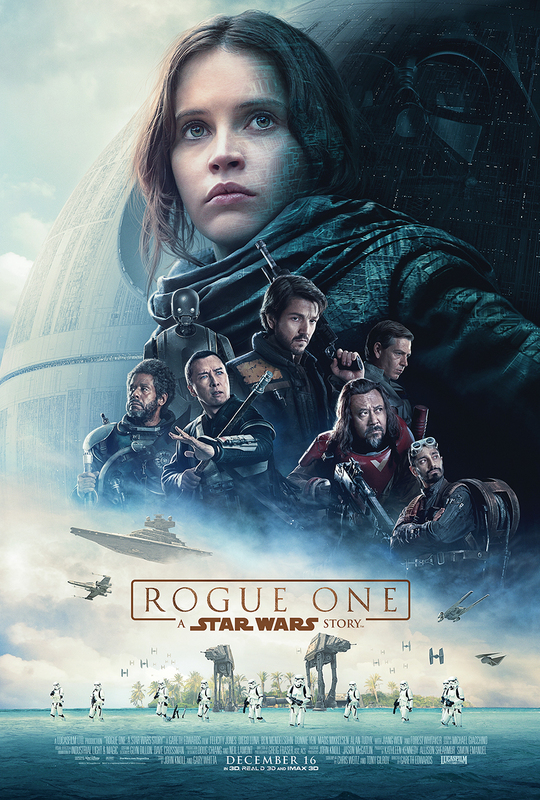 It's time for Star Wars once again, as I re-watch Rogue One: A Star Wars Story. This is in my notes at April 29, 2017. When Disney bought Lucasfilm and hit us with the promise of more Star Wars films, one of the more intriguing prospects was the announcements of spinoff films, focusing on side characters and hinted-at plot elements that we knew and loved. The description that Lucasfilm president Kathleen Kennedy once gave that has stuck with me is, "It's about thinking of the Star Wars universe as a setting, rather than a saga." This project was given the blanket title Star Wars Anthologies, and the first one was Rogue One, detailing the Rebellion's plan to steal the plans to the Death Star. It'll probably be some years before when we find out if and how much of a trouble production Rogue One was. The fans went into full panic mode when it was announced that reshoots were taking place, when just about every major blockbuster has them these days. Kevin Feige over at Marvel says that every Marvel movie has reshoots in the production schedule, as that's just how things are done these days. In response to the reshoot controversy, Force Awakens director JJ Abrams said, "No one batted an eye when we did six weeks of reshoots [for The Force Awakens]." But still, people have reviewed the trailers and there's a lot of cool shots in the trailers that didn't make the finished film, which always lead people to wonder what exactly was changed. Didn't really matter, because it was still a super-gigantic hit and the critics loved it. But me...ehhh. I mean, to me, the plot seemed rather perfunctory. "We gotta go here to do this, and then do that, and then the big finale." A lot of it felt the characters just moving along, making mandatory stops, until the huge, gigantic battle climax. And don't get me wrong, that final battle is amazing, but the journey there was "meh." I have to agree with some critics I've read online now who compared it with director Gareth Edwards' reboot of Godzilla...that was another one where it was just a lot of characters walking through ancillary adventures until the gigantic climax. They head to Jedha, a planted that was once sacred to the Jedi. It's rich in Kyber Crystals, which is what powers a lightsaber. The Empire has been strip-mining the planet for the crystals. (They power the Death Star, you see.) This is where Saw is currently leading his one rogue cell to fight the Empire. (The rest of the Rebellion started considering him too fanatical and too brutal in his tactics.) Jyn has her reconciliation with Saw, and sees her father's message: he sabotaged the Death Star. Designed it with an unstable reactor. One well-placed proton torpedo, and the thing is done. But, to exploit this weakness, they're going to need the Death Star plans. I will admit, I like some of the stuff with Saw. My favourite moment. When Bhodi, the Imperial pilot and friend of Galen's who smuggled out the message, first meets Saw. Saw has a breathing problem and takes a hit off a respirator. It makes a sound very much like Darth Vader's breathing, and the hint of PTSD that flashes across Bhodi's eyes when he hears that sound is just perfect. Anyway, the Empire decides to level the city with the Death Star on low power as a weapons test, and everyone just barely makes it out. in the one element that had me rolling her eyes, in the rush to get away, Jyn forgot to take her father's recorded message with her. So now they've got no proof. Next stop: Eadu, the planet where the Empire has Jyn's father. Maybe if they rescue him, he can deliver the message personally. But, turns out Cassian's real mission is to assassinate Jyn's father, as he's developed the reputation as the Empire's chief weapons designer. This is, perhaps, my biggest problem with film. The entire Eadu sequence seems like a pointless side quest. Cassian's conscience won't let him assassinate Galen. Doesn't matter because the Rebellion has already called in an air strike. And Jyn winds up being too late to save her father. It doesn't really add anything. I almost forgot, before they left Jedha, they picked up my two favourite characters in the film: Chirruit Imwe and Baze Malbus. Back in the more civilized times, they were Jedi Temple Guards...the Guardians of the Whills. But now, they make their living as a fortune teller and a mercenary, respectively. They really are the Obi-Wan and Han Solo in this film, as Chirrut still believes in the Force, and Baze has lost faith and now puts his trust in a good blaster by his side. But anyway, they return to the Rebel HQ, with no evidence, and so the Rebellion is reluctant to greenlight a mission to steal the Death Star plans, from a heavily fortified facility on a planet called Scariff. So our heroes go rogue and do it anyway. And here's where the awesome climax comes in. We've got space battles. We've got battles on the ground, on the beaches, as Scarrif seems to be a tropical planet of nothing but islands and oceans. So many awesome battles taking place! And, it all ends with that awesome Darth Vader cameo. Just like I always skip to the end of Phantom Menace for the Obi-Wan vs. Darth Maul duel, I'll probably always skip to the Darth Vader hallway fight. But with the awesomeness of the Darth Vader cameo, we almost overlook the real villain in the piece: Director Krennick. He was the one in charge of the Death Star project during its construction, but now that it's almost finished, the military is taking charge (led by a digitally resurrected Grand Moff Tarkin), and he's upset at being pushed aside. Who would have thought that the villain's grand scheme involved office politics and making sure he got credit for his project? So, yeah. Rogue One. It's good, but we never really got much a chance to get to know our new characters. This was always sold as a heist film, and the fun in a heist film is always seeing the different personalities and how they bounce off each other. Sadly, we didn't get much of that. But if you can make it through to the big fight finale, it almost makes up for it.